On the day of the Fed's most recent rate hike, traders found deep liquidity in Treasury futures. Interest-rate decisions made at meetings of the Federal Open Market Committee (FOMC) are typically market-moving events. While instruments like the CME FedWatch tool can fairly accurately project expectations of whether the FOMC will raise rates or not at those meetings, the actual announcement and subsequent press conference usually drive increased volume in key Treasury products. For example, on Sept. 26, 2018, the FOMC made a scheduled announcement that it would increase core interest rates 25 basis points, to a range of 2 – 2.25 percent, a move that the market was largely expecting. The decision was announced at 1 p.m. CST, and the market reaction took hold immediately. While there was some initial volatility and elevated volumes and price changes, the rates contracts most impacted by such announcements (the 10-Year Treasury Note, 10-Year Ultra Bond, and 30-Year Treasury Bond) maintained deep liquidity throughout the trading day. This ensured traders were able to move any necessary positions and hedge their risk in the face of increased rates, without undue constraints. 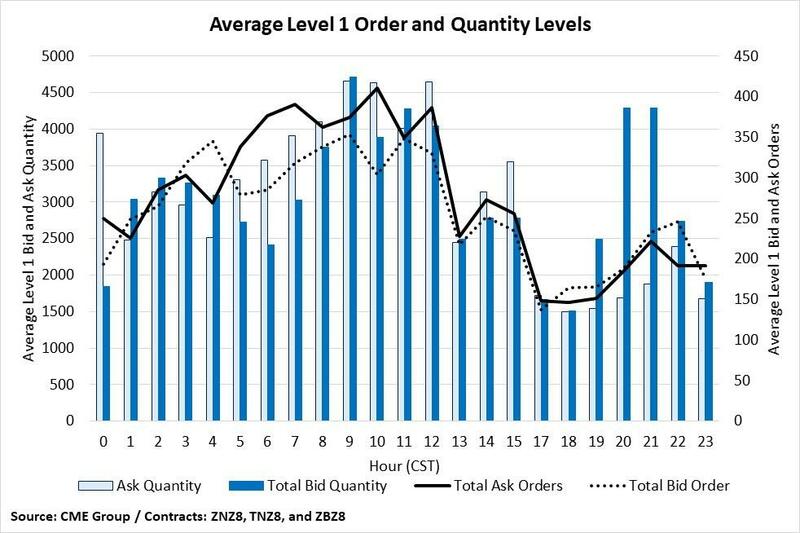 The amount of bid and ask orders and quantities available for these products on an hourly average basis show only a minor dip following the FOMC announcement, reflecting a higher utilization of liquidity during the period of higher volatility as a result of the rate increase decision. However, the amount available during these periods is in line with the levels seen in the early Chicago trading day. The reasonably steady hourly depth shows that there was more than sufficient opportunity to trade on either side of the market throughout the trading day, including when markets were absorbing the news of the rate increase. Markets were, unsurprisingly, very active after the FOMC decision was published, but it does not appear to have resulted in a reduction in trade availability. This liquidity illustrates the longer-term trend of open interest growth in CME core Treasury futures. Open interest is an indicator of long-term liquidity. Higher open interest suggests that traders will be better able to get in and out of positions quickly and take more or larger positions without moving the market. As the Federal Reserve has begun tightening interest rates, markets have looked to these contracts to position themselves against changing market dynamics. Markets react quickly in response to event risk, such as the Sept. 26 FOMC announcement of an increase in core interest rates, frequently moving volume and prices dramatically. Even in a move that was widely predicted — correctly — by market participants, as this rate increase was, there can be uncertainty with regards to the long-term impact of rate changes. The 10-Year Note, Ultra 10-Year Note, and 30-Year Bond often experience significant movements in the wake of FOMC announcements as traders position themselves based on their expectations for the impact on the market in the longer-term. This market activity is supported with the liquidity we see throughout the trading day in these products, even after the FOMC announcement. Long-term open interest growth has also demonstrated the liquidity of these markets, ensuring traders are able to manage their exposures and risks even during changes to market dynamics.